That evening about 7 PM we went by the Renaissance Worthington Hotel and picked up our registration packets. 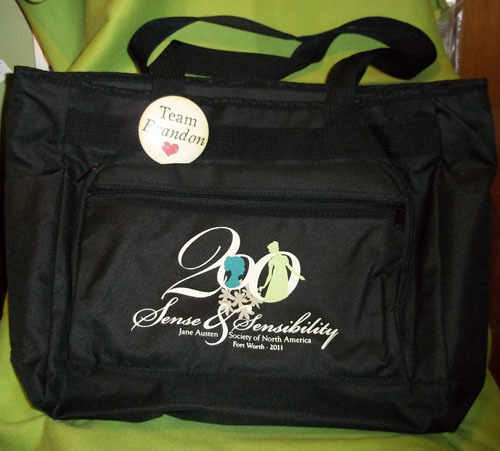 We each received an awesome bag filled with goodies. Although I brought a nice dress to wear to the ball, it was not a period costume like my husband’s, so I did a little shopping Thursday afternoon for accessories (shoes). Highlights from my dancing class and sessions as well as the the banquet and promenade around Sundance Square are in my video entitled, JASNA AGM 2011- Episode 1 (~ 7 minutes). 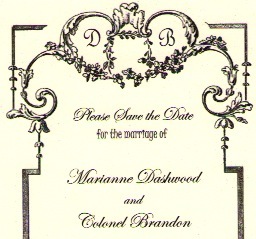 Beginning at 10 AM a brunch celebrating the marriage of Miss Marianne Dashwood to Colonel Brandon took place. The newlyweds made an appearance but so did Willoughby. Thankfully, Colonel Brandon dealt with the scoundrel, and we were able to finish our Barton Cottage bacon and Delaford fresh fruit in peace. 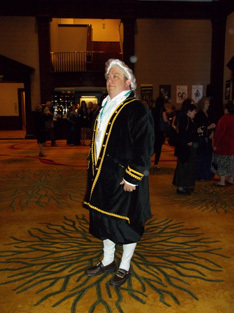 I was scheduled to visit several elementary schools in Fort Worth next week, and when I realized the 2011 JASNA AGM is also in Fort Worth and coincides with my trip, I knew I had to attend. I was too late to obtain an author table for the member book signing, but I’m so excited about the sessions and the Regency Ball Saturday night. The only question is, what will I wear? In the morning I visit Dobbs Elementary, and in the afternoon I go to Springer Elementary school. That evening, sometime between 4 and 8 pm, I’ll drop by the Renaissance Worthington Hotel and pick up my registration packet for the AGM. 8:30 am – 10 am English Country Dancing Instruction. This class will prepare me for the Regency Ball Saturday night. From the Chawton Estate, the British crime writer Lindsay Ashford, whose novels have been published on both sides of the Atlantic, will tell a fictional story that follows the relationship of Jane Austen and Anne Sharp. Shocked by Jane’s death, Anne turns detective, determined to discover how Jane died and who may have wanted her dead. Attendees will learn that it is best not to take things at “face” value. During this engaging special session, Ms. Bradley will review the nuances of Regency clothing and accessories from head to toe, with particular attention to the class distinctions and the social aspects of dress. 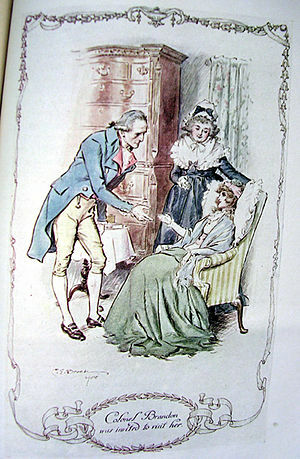 Included in her talk will be an explanation of likely wardrobe choices of various characters in Sense and Sensibility. After dinner on my own, I will step back into the Regency period with special guest lecturer Jinger Heath, founder of BeautiControl skin care company. Ms. Heath will enlighten us on the perils of beauty with her presentation “A Look to Die For: Regency Cosmetics and Esthetics,” which examines the various methods and means that women used to enhance their looks in Jane Austen’s time. I’ll learn which poisons of the past were used for “enhancing” a woman’s looks and what social conventions dictated the sacrifice of health for beauty in Regency England. In the morning I visit Redeemer Montessori School in Irving, and that afternoon I return to the JASNA AGM. The official welcome to the 2011 JASNA AGM is at 1:30 pm. 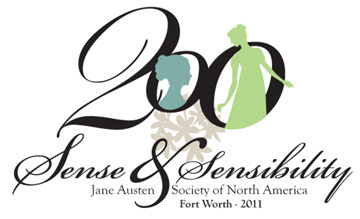 1:55 pm to 2:55 pm: Dr. Joan Ray will discuss “Sense and Sensibility as Austen’s Problem Novel”. 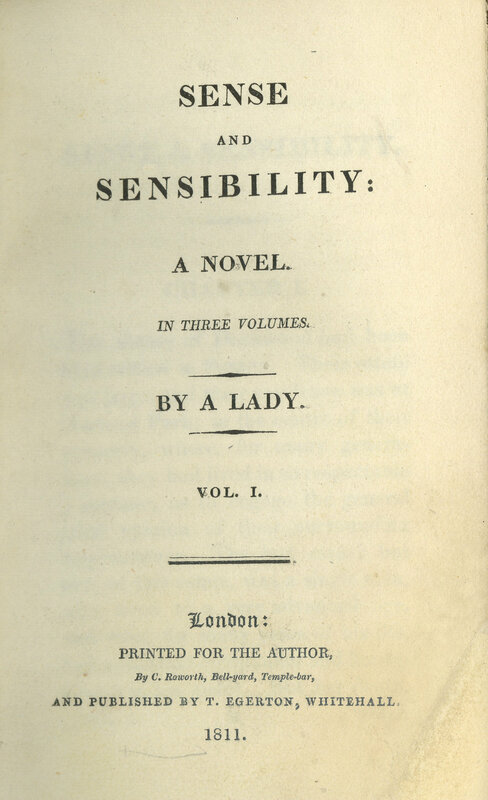 “I am never too busy to think of Sense and Sensibility. I can no more forget it, than a mother can forget her suckling child” – so wrote Jane Austen to her sister Cassandra. But Austen had to use her own funds to become published. Learn about the publishing world in Regency times and the royalties Austen received, drawn mostly from her own letters and from those of Austen family members. This interactive session explores snuff and snuff etiquette, the many styles of cravats popular during the period and the firearms of Regency gentlemen. Participants will have an opportunity to try their skills at tying cravats, handling snuff and observing the discharge of a flintlock tinder lighter. Fun, fun, fun!!! The Prince Regent, a man of overindulgence in many ways, liked his punch “strong.” Join Bill Peirson as he reviews the various ports, sherries, brandies, and other alcoholic beverages that men of Regency England consumed with verve. Whist Tournament 8:30 to 10 pm or perhaps the Sense and Sensibility Movie Marathon from 7pm to Midnight. This session’s primary question asks, what does Jane Austen’s portrayal of male characters say to contemporary male readers? How do these groups of characters—the “Dads” who head up families, the “Cads” who disrupt them and the “Lads” who heroically wed our heroines—impact the loves and relationships of the two sisters in Sense and Sensibility? A real Scotman’s perspective! 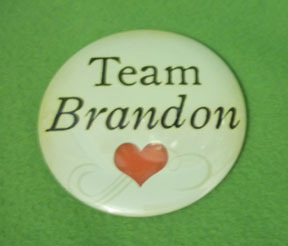 Since the duel between Colonel Brandon and Mr. Willoughby takes place entirely off the page, modern readers might not realize that a duel occurred at all. The unwritten drama in which the gentlemen in question risked death and criminal prosecution is brought to life in a multimedia presentation showing how the duel might have unfolded. From Jane’s donkey-cart, to Henry Crawford’s barouche, Regency travelers, like us, hoped for speed, comfort and safety. Unfortunately, Jane and her contemporaries had to sacrifice speed for safety or vice versa and endure the discomfort of long kidney-rattling journeys which made for extended stays with friends and relatives. In this session I’ll learn all about Regency travel, and how your mode of transportation illustrated your status in life. 7-8:30 pm Banquet and a Toast to Jane Austen. 8am – 10 pm Regency Emporium and Author Book Signing. 10am – 12 pm Brunch featuring video interview of Deirdre Le Faye, a British writer who has specialized in the life and times of Jane Austen for more than forty years. The most famous Danish writer for children, Hans Christian Andersen, died 136 years ago today. 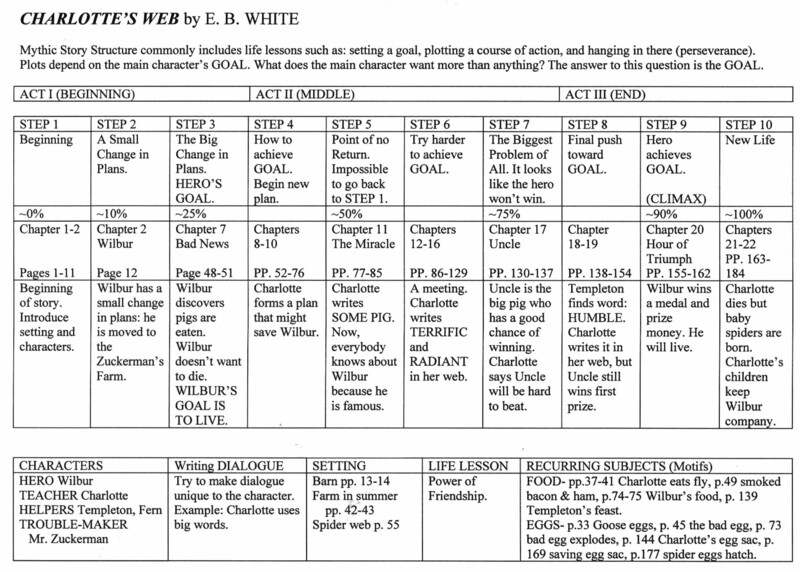 He is the father of the modern fairy tale, and I am one of his most dedicated students. 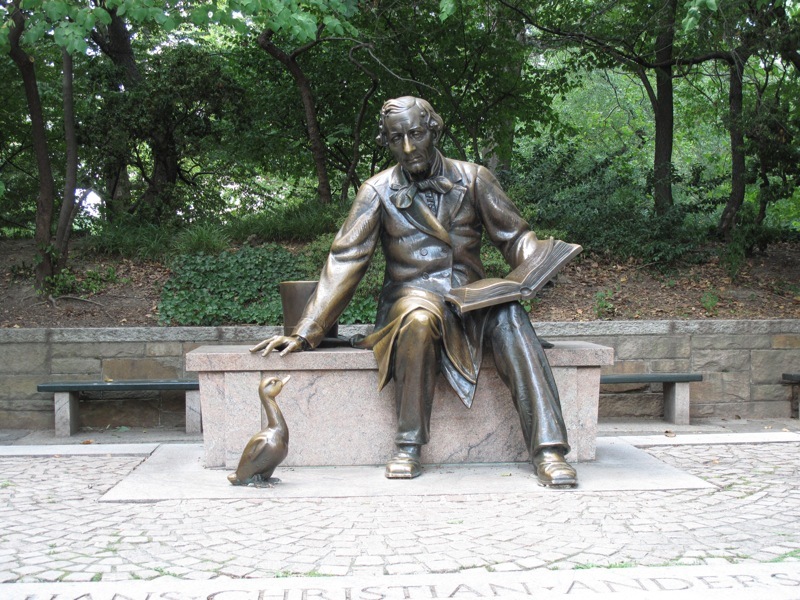 Statue of Hans Christian Andersen in New York City's Central Park. Image from Wikimedia Commons. Of the many authors I admire, Hans Christian Andersen has influenced my children’s writing the most. His timeless stories have a universal appeal, and when I create a picture book, I strive to emulate his style. My third picture book, POLLIWOG, was heavily influenced by Andersen’s THE UGLY DUCKLING. “At last the large egg broke, and a young one crept forth crying, ‘Peep, peep. '” The large duckling does not know he will become a swan. Likewise, in my story, little Polliwog does not realize she will turn into a frog. In homage to Andersen, the species of my frog is a Spring Peeper. Polliwog does not sing in my story because female spring peepers do not sing. Only the male frogs sing, ‘Peep, peep, peep,’ but Polliwog will lay eggs and hatch more little polliwogs thus continuing the circle of life. 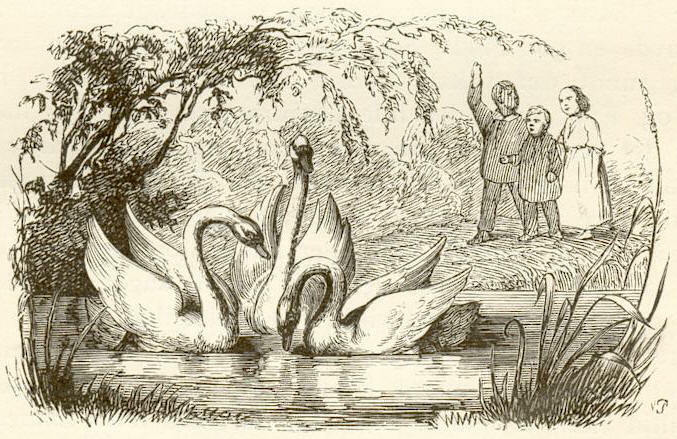 Vilhelm Pedersen illustration for "Ugly Duckling" from Wikimedia Commons. 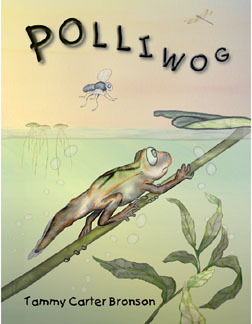 POLLIWOG is a popular book with boys, but the boys often comment on the fact that Polliwog is female. Several boys asked me to put a male hero in my next book, so I chose to write about a sea horse. Although I was not consciously aware of it, I believe Andersen’s THE LITTLE MERMAID had some influence on my latest book, ‘SEA HORSE, RUN!’. Hans Christian Andersen was born April 2, 1805 and died August 4, 1875. 136 years later, Hans Christian Andersen’s stories for children endure, and he continues to influence modern literature. Read an essay about The Father of the Modern Fairy Tale by Terri Windling. Visit the Hans Christian Andersen Center. The Ugly Duckling (1844; On-line version annotated by Heidi Anne Heiner). The Little Mermaid (1837; On-line version annotated by Heidi Anne Heiner). Find more annotated fairy tales at SurLaLune FairyTales.com. 1) While the movie franchise may be ending, the Harry Potter e-book revolution is just beginning. In October of this year J. K. Rowling will launch a new chapter in Potterdom with POTTERMORE. Profits from POTTERMORE and the e-books will carry Harry to new heights! Learn more at: http://www.pottermore.com/. 3) The fans that run The Leaky Cauldron will continue with LeakyCon their annual charity conference. LeakyCon 2011 blasted off on July 13, 2011. Follow the convention at: http://www.leakycon.com/. 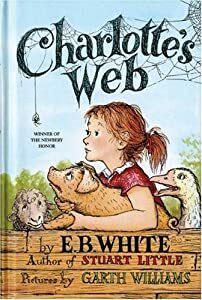 Bear in mind that many of the articles contain SPOILERS, but even if you haven’t read the series, I would encourage parents and educators to explore the deeper meaning of the books through these articles. This article, Harry Potter and the Ivory Tower, is written by my favorite writer for Potter analysis, John Granger. (Yes, that is his real last name! He is not related to Hermione.) Visit his blog at: http://www.hogwartsprofessor.com/johngranger/. Harry Potter’s Bookshelf: The Great Books Behind the Hogwarts Adventures. The next link (http://thinkingmatters.org.nz/tag/harry-potter/) will provide you with three short essays. The first, Is the Magic of Harry Potter Evil, emphasizes the importance of understanding the symbolism in the books. If you continue scrolling down, two more articles present themselves. 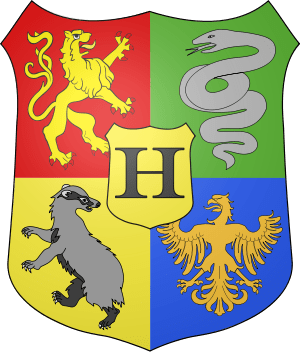 Muggle Matters: Is Harry Potter a Doorway to the Occult explores five reasons why Harry is NOT evil. Continue scrolling down for the final article: Harry Potter and Deathly Hallows: A Christian novel? I’ve visited more than 525 elementary schools across the United States in the past ten years, and reactions to Harry Potter are always mixed. Sadly, some schools have banned Harry Potter. The next article addresses and rebukes many of the specific arguments used to ban Harry. This PDF is a brief study guide created by David Elfering of the Greek Orthodox Church of Greater Omaha.